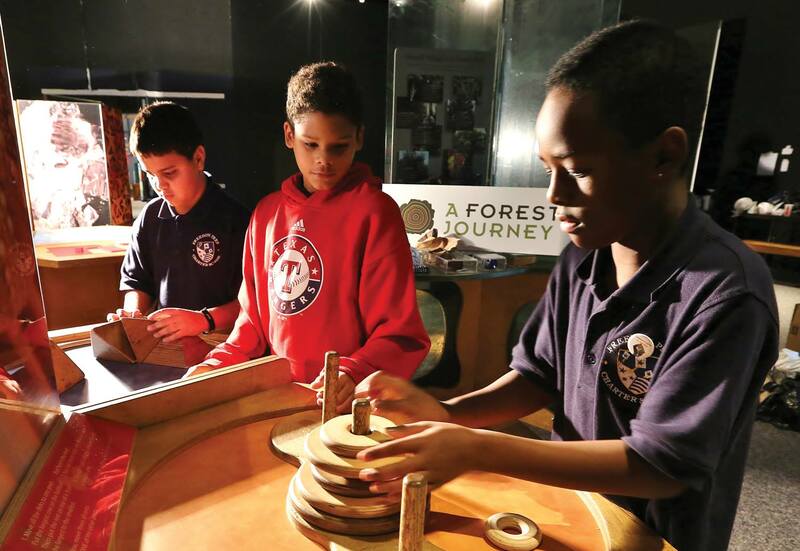 Explore over 8,000 square feet of hands-on, fun and interactive learning opportunities from both national and international touring exhibits and select permanent exhibits from the DHDC collection. Exhibits change every fall, spring and summer, providing visitors new discoveries every visit! In the near corner stands Triceratops. In the far corner, Tyrannosaurus Rex locks his eyes on his opponent. And the winner is?! Visit DHDC to find out how this match likely went down. Just as in a boxing match, the exhibit provides a detailed comparison of each dino and shows the advantages and disadvantages both would have in battle. Visitors learn that not only were they perfectly matched to fight each other, but they depended on each other to survive as a species. Facts and clues are given throughout the exhibit to this strange paradox of interdependence. But who wins? The answer lies in the environment – the plants, forest and ecology that shaped their existence, and ultimately led to their extinction. This Wonder Works exhibit explores the amazing mingled destinies of plants, dinosaurs, and mankind. Battle of the Titans will be on display at the Don Harrington Discovery Center January 26- May 19, 2019. Located just outside the Space Theater, The Space Gallery is dedicated to exploring weather conditions on Earth and beyond. Multimedia presentations reveal real-time data regarding weather conditions on Earth and explore the science of common weather phenomena. Interactive displays examine space weather concepts such as auroras, solar flares and cosmic rays and uncover their effect on the Earth. Your visit to the DHDC will not be complete without meeting some furry and scaly friends. 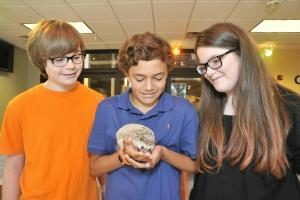 From a Bearded Dragon and Tarantula to a friendly snake we call ’Pinky’, Critter Row introduces guests to animals that come from different regions all around the world. Get an up-close look at these interesting creatures and you may even get an opportunity to touch one of them. Our trained Science Guides occasionally take the animals out to mingle. 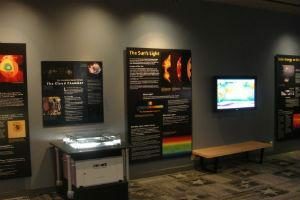 We are excited to be one of the institutions across the country awarded a copy of the Sun, Earth, Universe exhibit. This engaging, hands-on interactive exhibit is filled with dazzling imagery, and will connect you with current NASA science research and launch you on a journey to explore the universe! The Sun, Earth, Universe Exhibition was developed in collaboration with the National Aeronautics and Space Administration (NASA). Sun, Earth, Universe exhibitions are developed and distributed nationwide by the National Informal STEM Education Network (NISE Network). Sun, Earth, Universe includes fun and compelling exhibits for visitors of all ages. Follow the design-build-test cycle of engineering and build a model spacecraft for your own mission to space. Spin a tumbler of 10,000 beads, representing all of the stars we can see from Earth to search for the unique one that represents our Sun. Reveal hidden images using the same tools NASA scientists employ to explore the otherwise invisible forces and energy of the universe. Help younger visitors pilot rovers across the Mars landscape play table. These fun experiences (and many more!) introduce visitors to ongoing NASA research in the fields of heliophysics, Earth science, planetary science, and astrophysics, and encourage them to imagine what the future of Earth and space science might hold.